In this soccer circle drill, you have 1 ball and 1-2 players in the middle of a circle made up of players. 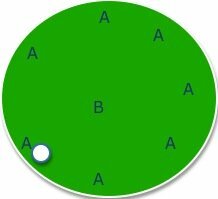 Use 1 ball and players on outside keep the ball from the middle player(s), while maintaining a circle shape. - Limit to 2 touches for outer players. - Players must keep the ball from the inside player, if inside player gains control he/she switches with player who gave the ball away or took 3 touches. - Example: Players A must keep ball from player B as long as they can or until it is a fair time to switch. This gets players playing lots of short, quick passes and gets their bodies lightly active prior to stretching and training. - Encourage to keep ALL passes along the ground. - Ensure all players stay "on their toes" so they are ready for any pass. - Mandate that touches on the ball must alternate, 1-touch to 2-touch to 1-touch, etc. This pushes quick feet and thinking. For example if the player that passed you the ball took 1 touch, you MUST take 2 touches, then the nex take 1 touch and so forth. - Add a 2nd defender, alter circle size if necessary.